Qatar Airways has confirmed it will begin a non-stop, more than 18 hour service between Doha and Auckland - set to become the world's longest flight - on December 3. The airline will operate the daily flights with a Boeing 777, the same aircraft rival Middle Eastern carrier Emirates uses for its new direct service to New Zealand, which launched last week and is currently the longest commercial flight available. 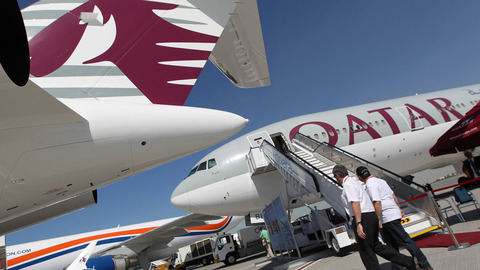 New Zealand travellers will be able to use the service to reach European destinations such as London via Doha, Qatar's capital. At 14,534 km, the Doha to Auckland route is slightly longer than the roughly 14,200 km Dubai-Auckland journey. The Qatar Airways service is expected to take up to 18 hours and 30 minutes, compared with up to 17 hours and 15 minutes for the non-stop Emirates flight. Qantas operates a Sydney to Dallas/Fort Worth service which covers 13,800 km and takes almost 17 hours. The longest flight operated by Air New Zealand is Auckland to Houston, which covers 11,933 km and takes 14 hours and 30 minutes. Emirates was expected to launch a service to Panama City later this month, which would have been slightly longer than the non-stop Auckland-Dubai flight in terms of duration. The Dubai-based airline, however, has reportedly put that service on ice so it looks like the Auckland route will remain the world's longest duration flight until Qatar Airways starts flying to New Zealand at the end of the year. Qatar Airways announced another 13 new destinations at a major travel fair in Berlin today, including services to the Italian city of Pisa, Sarajevo in Bosnia, Finland's Helsinki and Marrakesh in Morocco. "These new destinations are where our customers want to go, and where we see the most opportunity to provide a best-in-class experience at great value," said Qatar Airways chief executive Akbar Al Baker.